This blog was written by Dr Alison Buckler, a Research Fellow in International Education and Development at The Open University. 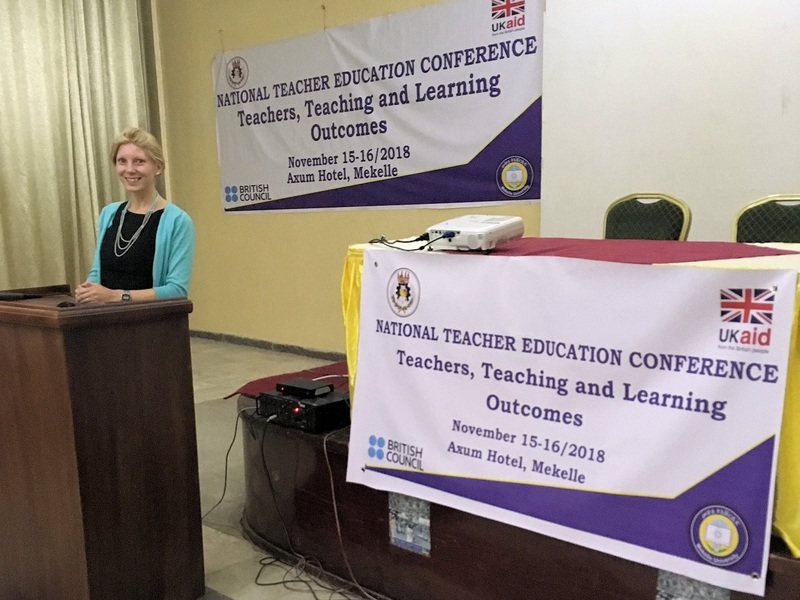 A few weeks ago I travelled to Ethiopia to deliver the keynote speech at their National Teachers’ Conference. My remit was to present some global examples of ‘different thinking’ in relation to the three conference themes of recruiting, educating and retaining teachers. When I was preparing for the keynote, I read an article about why teachers drop out in Ethiopia. One teacher, who lasted for one day in a rural school before quitting, said ‘I never had any desire to be a teacher. I could guess what their lives were like’. And we can guess, can’t we? We can all imagine how hard it must be for teachers travelling to remote schools to stand in front of possibly hundreds of children with not enough training, resources, furniture or support. The draft Ethiopian Education Development Road Map, released earlier this year, emphasises these challenges. It highlights inadequate infrastructure and equipment in many schools, unsupportive leadership, and teachers without the training, confidence or time to help children with diverse language skills and learning needs. It also highlighted both geographical and subject areas with severe teacher shortages, leaving many teachers with huge classes and limited opportunities to share their professional interests with colleagues. Some student-teachers are required to study and teach a subject they do not have a background in. Some colleges of education release student-teachers into teaching posts before they finish their training to fill gaps in teacher provision. These issues are not unique to Ethiopia. Having enough teachers to ensure that all children have access to a skilled professional across a range of subjects, and ensuring that teachers feel confident and supported in their work are enduring global pursuits. However, it is becoming increasingly clear that simply expanding current models of teacher and student learning will not be sufficient. UNESCO data tells us, for example, that Zambia has been increasing teacher recruitment by an average of 4% a year. Yet it needs to increase by 10% a year to achieve national and global targets. In Ethiopia teacher recruitment has increased by 2.4%, but needs to increase by 7.4%. In many parts of Africa, even if it were possible to build secondary schools for all children, you would be unlikely to find a mathematics or science teacher for 1 school in 20. The main point I made in my keynote was that if we are to recruit, educate, and retain teachers to support the learning of all children, we are going to have to reconsider our ingrained notion of what sites of learning could look like – for students and teachers. Recently, a team from the Open University researched a report for the Education Workforce Initiative. We drew on several OU international teacher education programmes, and reviewed 50 other initiatives from around the world that were ‘thinking differently’ about training and supporting teachers. In the report we presented some principles focused on the issues of scale, distribution, learning and support in the teaching profession. You can read the full list of principles in the report, but I will highlight three here. First, it is really important to recognise that schooling is a collective endeavour. In a primary school, no one teacher can manage all aspects of a single child’s learning needs. In a secondary school, no one teacher can manage the learning needs of 50 or 100 or 200 children. Therefore, schools need a greater number of adults in them. These adults would take on a wide range of support roles (so that teachers can be freed-up from non-teaching tasks such as marking and administration) including particularly skilled work like supporting children’s emotional well-being and home-school liaison. These additional adults are not volunteers; they have clearly defined roles and are recognised as professionals in their own right. In the discussion of the keynote, His Excellency Dr Tilaye Gete, Ethiopia’s Minister of Education, highlighted the benefits of these adults coming from the local area. He suggested that locally-recruited learning assistants could mediate the teaching, offer support in translation where necessary, and help teachers to acclimatise to unfamiliar environments. Crucially, schools are recognised as sites of professional as well as student learning. A range of Open University programmes working in collaboration with governments and national organisations have shown how it is possible for teachers and education support staff – even in the most remote schools – to have access to specialist knowledge, learning materials, study groups and professional development programmes – often through their own mobile phones. Central to these principles are school-based learning – for initial and ongoing teacher education. In the past open and distance learning have been used to fill the gaps in teacher education. The nature and scale of need today, however, requires these approaches be at the centre, not the periphery, of provision. The Ethiopian teacher in the article said he felt like he was being ‘abandoned in the middle of nowhere’. Thinking differently about how teachers’ work and learning is organised and supported can’t change the geographical remoteness of schools, but it can help teachers to feel less isolated and part of something bigger.